iPhone owners have always been among the most snap-happy on the planet  Apple's devices are far and away the most popular on Yahoo's Flickr photo hosting service, for instance  and iOS 7 brings a wealth of new features and enhancements for shutterbugs. The iOS camera app has seen a few aesthetic tweaks since the introduction of the original iPhone in 2007, but iOS 7 brings an entirely new look and new methods of interaction using touch. Gradients and three-dimensional buttons are replaced by flat black and simple shapes, and the stalwart shutter closing animation that signaled a photo being taken is eschewed in favor of a simple flash of light. The options menu has been removed and the HDR and panorama selectors placed in the top-level UI. The HDR button joins the flash toggle and front-to-rear camera swap button in a black bar along the top of the preview pane, rather than in translucent buttons atop the image. Users can now enable or disable the grid overlay from the system settings app. The camera application adds an additional "square" shooting mode  which natively captures a square format image, rather than cropping a larger one  to the holdover video, panoramic, and normal photo options. Mode selection has been moved to a three-dimensional "ring" just below the preview pane, and users can switch modes by swiping in either direction. Interestingly, the mode selector does not rotate when the phone shifts from portrait to landscape orientation, so users will need to use a vertical, rather than horizontal, gesture in that situation. 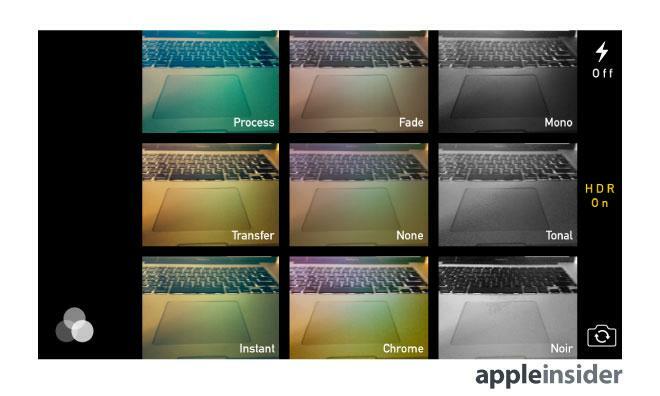 iOS 7's realtime image filters are available on iPhone 5 or newer. Older models can apply filters during post-processing. The new square aspect ratio shooting mode is tailor-made for social media sharing and is a particularly good fit for Instagram. National Geographic photographer Jim Richardson called out this feature specifically when using the iPhone 5s as his primary camera during a recent trek through Scotland. With the addition of image filters, Apple has integrated a tentpole feature of many third-party sharing or camera applications directly into the operating system, making for easier snapping and sharing of photos across services. Apple provides eight filters by default, and it is not possible for users to define their own. 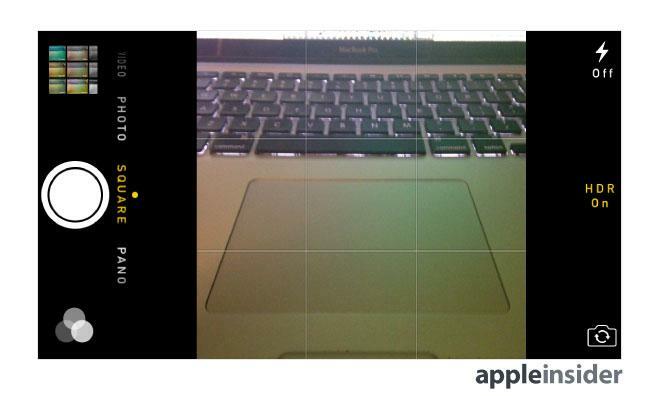 The preview pane can overlay the filters onto the live image for iPhone 5, 5c, or 5s owners. Filters can be chosen on a per-mode basis and will "stick" with that mode after the user leaves the camera application. Users who prefer to post-process images, or who want to apply filters to panoramas, can do so through iOS 7's photos application. Filters cannot be applied to videos. 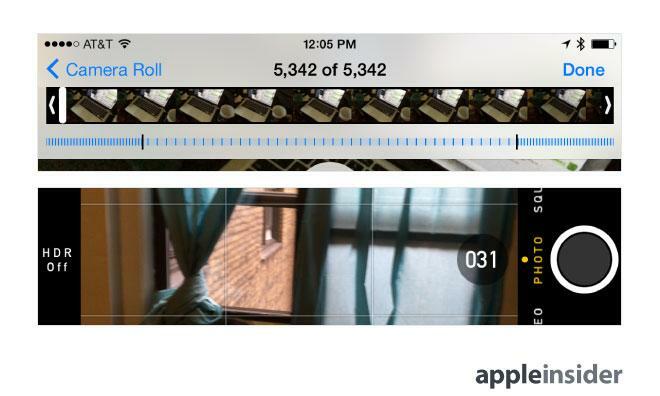 iPhone 5s with iOS 7's slow-motion editing handles, top, and burst mode image counter, bottom. For iPhone 5s owners, iOS 7 leverages the handset's beefy 64-bit A7 processor and upgraded camera module to provide some additional imaging options that require the increased horsepower  burst mode for still photos and slow motion for videos. Burst mode works much the same as it does on a traditional point-and-shoot or DSLR camera, where holding down the shutter button will take a rapid-fire series of shots. Apple's burst mode captures 10 photos per second, and iOS 7 will intelligently decide which photos or series of photos are best and allow the user to choose between them. A small counter appears above the shutter button while depressed to show the number of burst shots taken. Slow-motion video is enabled by the iPhone 5s camera's ability to capture video in high-definition 720p at 120 frames per second. After recording a video, users can choose which portions of the video to slow down using the same touch selection handles Apple introduced with the iOS version of iMovie. Another welcome addition for the iPhone 5s is the ability to zoom video while recording using a pinch gesture. Users are no longer required to set the zoom before pressing the record button.